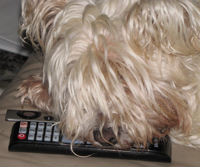 I do not know why, but our dog likes to hog the TV remote. It is probably because she gets used to having her own way when she is alone in the house, so she thinks she can control the TV even when the rest of us are home. But before I get too far and my wife, The Mindboggling Mrs. Miyoshi, starts calling me a liar, I must admit that I have never seen our dog, Yukiko, turn on the TV or use the remote to control it in any way. I am just suspicious that she does. Still, I took a few pictures as evidence to back up that suspicion. Now before I go much further, I need to assert that I did not stage the pictures I took of the dog with the remotes under her paw. 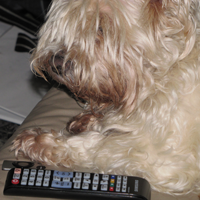 In fact, I have seen the dog hogging the remote like that many times. The pictures are just the proof that I wanted to display to show that my suspicions are not unfounded. That the dog really does watch TV when we are gone. We do not always leave our TV remote controls in the exact same place. They get left on the end table, on the arm of the couch, or even on the seat of the couch. Regardless of where they are, they are usually pointed toward the TV. Which is one reason why I suspect Yukiko of controlling the TV when we are gone. All she would need to do is put her front paw (not her hand as The Mindboggling Mrs. Miyoshi likes to call it) on the remote and press buttons. She could watch TV whenever we are gone from the house and nobody would be the wiser. The other piece of circumstantial evidence I have is that Yukiko seems to have a preference for different TV shows. We do not have cable and our antenna only picks up a few over-the-air TV stations. But we do have Netflix. When we are all home, there are times when the dog sits on the couch and watches TV with us (she always wants to sit between my wife and me, but that is another story). However, if Yukiko does not like what is on, she goes and lies down on the shoes (another another story) or goes outside. I imagine she is just pouting that we are not watching her shows. Her barking sounds like dejection rather than howling at the moon or the train. Besides, there are shows on the “watched by” list that I know I did not watch and that everybody in the house claims they did not watch either. Again, circumstantial. But experts (at least on TV shows) say enough circumstantial evidence can be enough proof. Unfortunately, regardless of any evidence, there is a simple rebuttal to the whole dog watching TV business. Yukiko does not have a blog. If our dog was truly watching TV all day long when nobody is at home (which is not on a schedule she could predict) she would definitely have a blog. After all, everybody has a blog these days. Everybody thinks they can write. And everybody thinks they can make money with their wonderful writing. So if our dog was truly watching TV, she would have a blog and write critiques about the shows she watches. She would probably even have more followers than I do. “Arf!” It is a bulletproof rebuttal. Picture and other evidence notwithstanding. Well I better stop before my rambling gets much more ridiculous. But before I do, I must confess that I really do not believe Yukiko watches TV when we are gone. She, like every dog, sleeps far too much for there to be any TV watching (or blogging). Beside, the chips and other snack food never disappear. So contrary to my suppositions and suspicions and even evidence, I must assert that our dog does not really watch TV. At least, I doubt she does. Even if she does like to hog the remote.